Taxpayers in the S-VE school district are again asked to pay for more waste and mismanagement. Deceiving the voters has almost become a tradition in the district. Below just two examples (there are more) on deceptions that cost the taxpayers dearly. Dont get fooled this time! Once they have a budget passed they can tax you out of your house. It has happened. Click here to read what happened to my 83 year old neighbor. In 2008 we all received a budget brochure assuring us that the tax levy increase will be limited to no more then 1.72 %. That fooled the voters to pass the budget. The School Board then increased the tax levy by 6.6%. Most of that gang is still on the Board, so beware! For details click here. That year the promises before the vote was a 12% increase. After some mumbo-jumbo by the Superintendent and the Board, the taxpayers got stuck with a 29.9% tax increase. I was on the Board at the time so read my first hand report here. With our past experience, I do not put much trust in the 8.9% tax increase number. But even if it is true, why is it so high? Why should we pay almost 9% more in taxes when the state average only goes up 3.4 %? Why have they not ended the double trip busing? There is three buses in the afternoon covering the same road. Why are they still keeping in place the costly discrimination against non-teacher coaches? Why do we have to not only pay for the education of our kids but also for masters degree studies for our teachers? Why do we not hire competent teachers to begin with? FULL YEAR'S PAY FOR 11 DAYS WORK. Superintendent Morgan in the Broader View Weekly article of 4-21-2011 puts a cost of a teacher, in our district at $100.000/year. Teacher work a maximum of 180 days a year. In the Van Etten school a teacher is 5 hours a day in front of the students. The hourly cost is thus $110/ hour. The teacher contract (2007 -2011) also for all kinds of paid leaves for that, if taken, enables the teacher to collect a full year's pay for working only 11 days. The teacher's contract is up for renewal this year. Your vote to reject the budget is a signal that we cannot year after year pay for this. 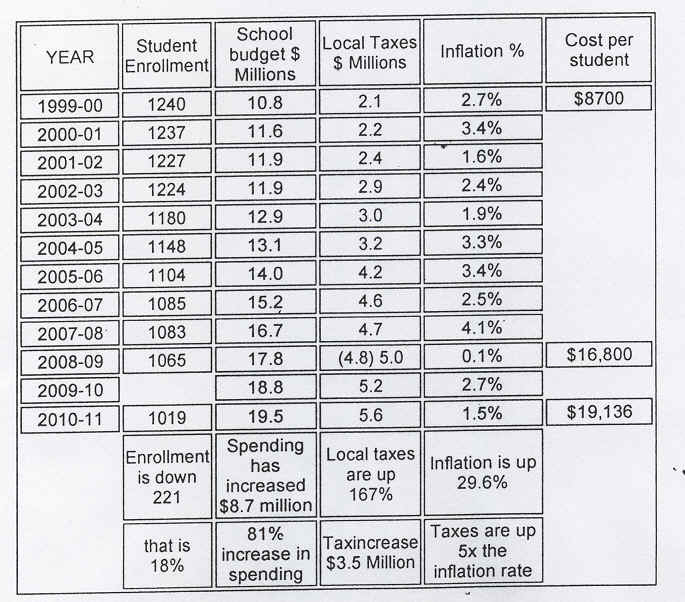 The below chart shows spending and taxes in our district for the past 12 years.